Hurray for Herbs, Herbs, Herbs!!! Just thought I’d put a little blurb about herbs! I wanted to remind everyone of my ever expanding offerings of awesomely aromatic and terrifically tasty useful little plants! There will always be a special place in my heart for herbs as they were the first things I grew (along with Plectranthus and Scented Geraniums) when I started this business. 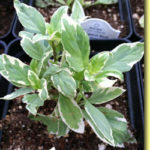 I’ve listed ones we may be growing this season; some are annual and many are perennial. They will be in various container sizes, with some also in planters with mixed herbs (great for gifts, hint hint!). Just remember we do run out so hurry on in!! !